C.J. Beathard likes the expectations that come with being the starting quarterback. The junior to be served as Jake Rudock’s backup at Iowa for two seasons before being moved to the top of the depth chart just days after a loss to Tennessee in the TaxSlayer Bowl. “I wish the best for him because we were friends and stuff, but he decided to part ways. Right now it has become my team and I am taking that leadership role. In some ways it is easier to lead when you are not trying to spilt reps and do all that stuff. 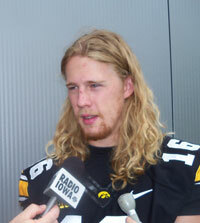 I like it,” Beathard says. Beathard led the Hawks to a come from behind win at Pitt last season and a win at Purdue when Rudock was injured. But that was the most significant action he saw before the bowl game. “It is a little frustrating you are just sitting there waiting…you begin to wonder when it is going to come. That’s all part of it, being patient and waiting for your time,” Beathard says. Beathard says Kirk Ferentz informed him he was the starter just days after returning from the bowl game. “He said I did some things in the game that he liked..the coaches all sat down and made the decision, they decided to go with me from here on out. I’m glad to hear that,” Beathard says.